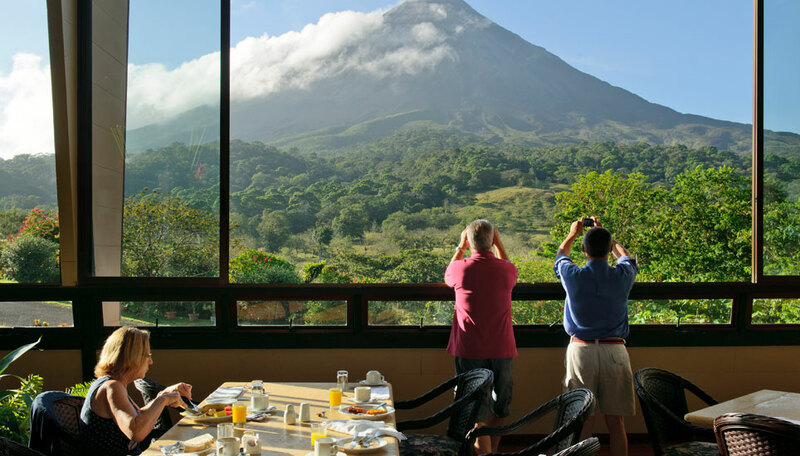 This all-suite hotel has extensive gardens, a spa, hot springs, and outdoor pool all of which you can enjoy to the full after hiking, ziplining and kayaking in Arenal Volcano National Park. Near Arenal volcano, national park and lake, 11kms north of the town of Fortuna. Arenal Kioro Suites and Spa is open year round. Arenal Kioro is convenient for visits to the national park with its lush rainforest, hanging bridges, gondolas and zip lines, and lake where you can explore by kayak, so days can be as action-packed as you wish. When you want some respite, you’ll appreciate a long soak in the hotel’s hot springs, all equipped with hydro-massage jets to ease any aches and pains, or a visit to the spa where you can choose from a long list of treatments. Relax with a stroll among the exotic trees and flowers in the gardens and cool off with a swim in the pool. When it comes to food and drink, there are 2 restaurants offering a variety of cuisines both in lovely settings, and 2 bars, 1 of which shows sporting fixtures on large screens. 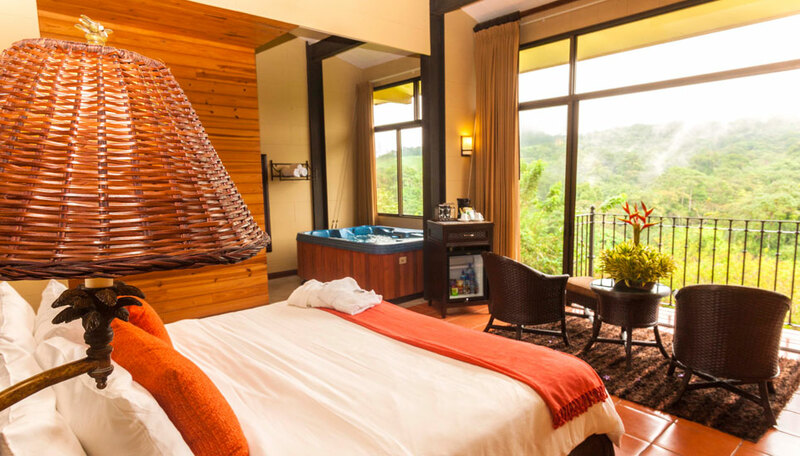 Each suite has a sitting area, bathroom with a shower and spa bath, and 2 balconies with views over the gardens towards the impressive sight of Arenal volcano. Why go to Arenal Kioro? 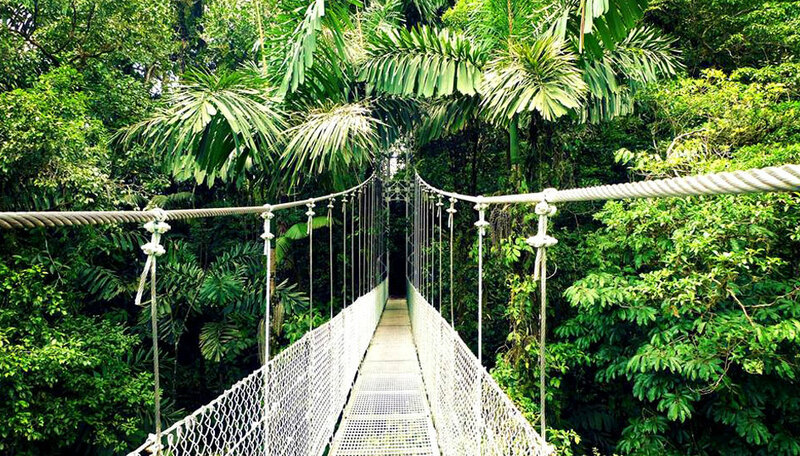 Explore Arenal’s rainforest and wildlife with a guide on hikes by day and night, and gaze across the forest canopy from the famous hanging bridges. Take the Sky Tram gondola to a viewing platform at the highest point in the reserve, then travel back the same way or opt for a descent by a series of exhilarating zip line rides. At Lake Arenal you can go kayaking, windsurfing, and fishing. When you’ve had your fill of action, treat your body to a therapeutic massage or soak in the hotel’s hot springs as you benefit from their health-bestowing properties, before sitting down to a delicious a la carte dinner in the restaurant. The 11 hectares of gardens are full of animal and bird life, and you’re likely to see howler monkeys, sloths and toucans on a regular basis. Arenal Volcano National Park has many species of birds, including motmots, bellbirds, manakins, orioles and hummingbirds as well as toucans, and animals such as monkeys, coatis, agoutis, armadillos, tapirs, deer, frogs and lizards. There are 53 suites, 11 of which have 1 king size bed and sleep up to 2 people, while the remaining 42 have 2 queen size beds and sleep up to 4 people. Each has 2 small balconies looking towards Arenal volcano. All are air conditioned, have a sitting area with a daybed, safe, coffee maker, minibar, cable TV, IDD phone, complimentary Wi-Fi, hairdryer and en-suite bathroom with jet tub, shower, twin hand basins, toiletries and bathrobes. Children of all ages are welcome. The queen-bedded suites sleep up to 4 people, and cots or child beds can be supplied at no extra charge. There is free Wi-fi in all rooms and social areas. All rooms have telephones to place and receive international calls.